The simplest imaginable conformation for cyclohexane, the planar one, is not only not the ground state conformation, it is so high in energy that it plays no part in the conformational analysis of cyclohexane.This is mainly because of the large amount of torsional strain which is present in this form. Thus, all six C-C bonds in the planar form are eclipsed, so that we could crudely estimate the torsional strain as being at least 6 times that in eclipsed ethane, which has one eclipsed C-C bond, or 18 kcal/mole. The ground state conformation of cyclohexane is a fully staggered conformation which is shaped somewhat like a "chair". In this conformation there is no torsional strain at all, and as we shall see later, no strain of any kind. Cyclohexane is unique in being the only cyclic hydrocarbon which is completely strain-free. So the six membered ring is the most stable of all.So we see that torsional effects, although individually small (per C-C bond), exert a tremendously important effect on the shapes of molecules, and shapes often effect reactivity. In the chair conformation, four carbon atoms are coplanar, and the other two are puckered out of this plane, one being puckered up above this plane(the carbon at the extreme right of the depicted chair form) and one being puckered down out of this plane(the one at the extreme left of the illustration). 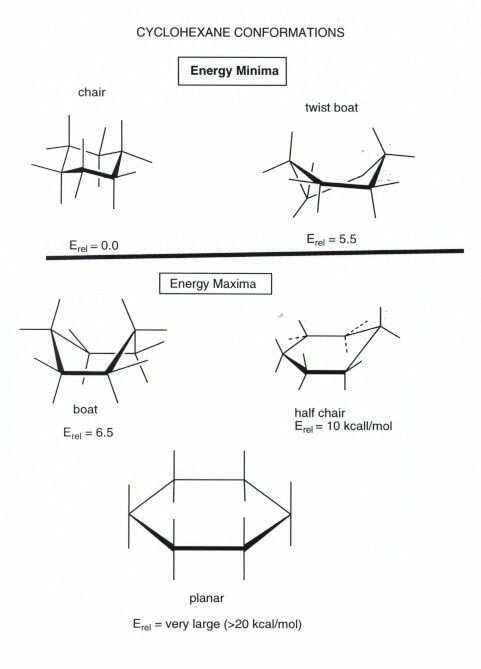 Another conformation which is important in any conformational analysis is the transition state, or maximum energy conformation on the rotational path.For cyclohexane this is the so-called "half-chair conformation", in which now 5 carbons are co-planar, and only one is puckered out of the plane. In the illustration above, starting from the chair conformation, the half-chair form depicted arises from moving the left-hand-most carbon of the chair form , which is puckered down, upward into the plane of the four coplanar atoms. This creates considerable torsional strain, especially around the two carbon-carbon bonds involving the left-most carbon. The energy of this conformation is about 10 kcal/mol. The importance of this is that in any conformational changes in cyclohexane, 10 kcal is the energy barrier, and the pathway for such conformational changes must proceed through this relatively high energy conformation.Because this barrier is so much larger than that in ethane or butane, cyclohexane conformational changes can be "frozen out" at, e.g., -78 degrees. However, they are rapid at or near room temperature. For all practical purposes, only the chair form is populated. There is, as in the case of butane, another energy minimum structure which can be populated to a certain extent. This is the so- called "twist boat" conformation. However, since this conformation is 5.5 kcal/mol higher in energy than the chair conformation, it is not a highly populated state.Again, most of the strain energy results from bonds which are eclipsed or partially eclipsed, i.e., from torsional strain. 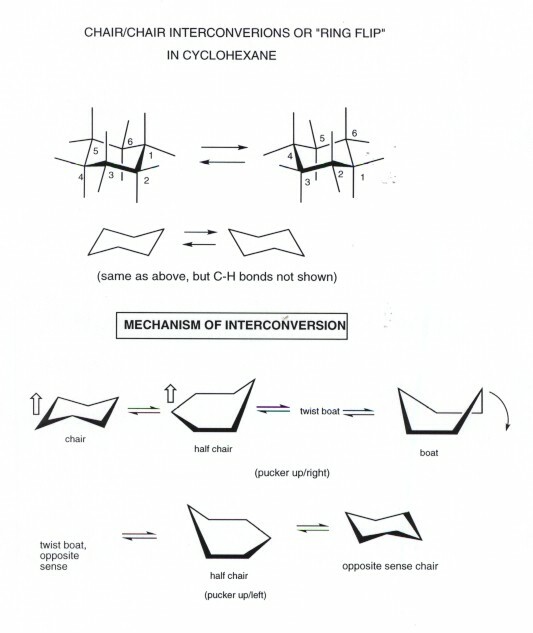 Note that in chair cyclohexane, there are two different types of C-H bonds, and thus two chemically different types of hydrogens. The C-H bonds which point vertically upward or downward are called axial. There are 6 of these, 3 upward and 3 downward bonds, and they alternate up/down/up, etc., around the ring. The other six bonds, which radiate away from the "equator" of the ring are called equatorial, and again there are six, 3 of which are "slant up" and 3 of whicdh are "slant down", again alternating around the ring. 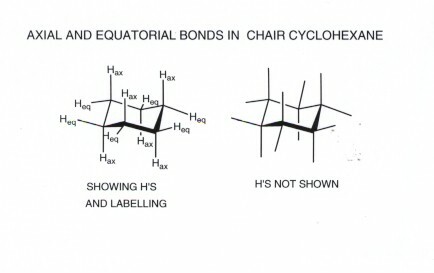 You should be able to quickly draw cyclohexane rings in which the axial and equatorial bonds are readily identifiable and distinguishable..
Up to now we have not described in detail the rotational path of cyclohexane and what is the end result. We understand that the best path (the lowest energy path) available proceeds via the half chair and requires an energy input of 10 kcal/mol. 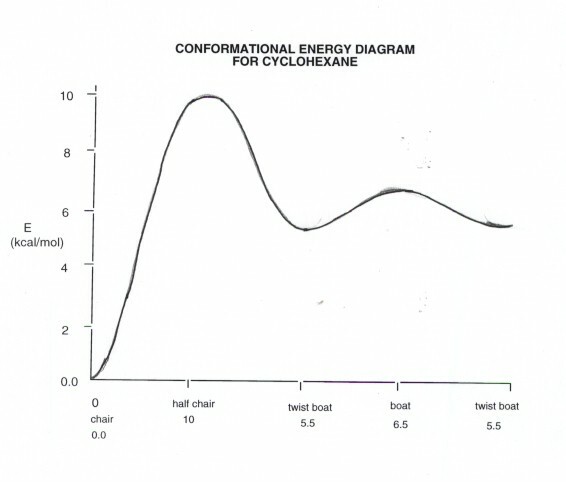 This transition state proceeds to a twist boat energy minimum, but this is not highly popupulated and generally plays little or no role in cyclohexane's structure or chemistry. However, the twist boat can interconvert with another equivalent twist boat (via the true boat conformation as a transition state) to give another chair structure, in which the sense of the ring puckering is reversed. This is significant in cyclohexane itself, because in this process the axial and equatorial hydrogens are interconverted.Since this interconversion or ring flip occrus rapidly at room temperature, all hydrogens spend 50% of their time as axial hydrogens and 50% of their time as equatorial hydrogens, so that on the time average all C-H bonds of cyclohexane are equivalent. However, at any given instant, there are always two types of hydrogen. Since axial and equatorial bonds are non-equivalent, there are two non-equivalent positions in which to place any substituent. We use the simple methyl group as an example, but the same concept applies to any substituent. Equatorial methyl cyclohexane is the more stable conformation. When the ring flip occurs, however, it converts to axial methylcyclohexane. These two conformations are in rapid equilibrium at room temperature, but can be frozen out as distinct compounds at -78degrees. The equatorial conofrmation is favored in the equilibrium by a modest amount because the axial isomer has about 1.8 kcal/mol of steric strain. This strain arises from the interaction of one of the hydrogens of the axial methyl group with each of the two other axial hydrogens on the same side of the ring, as illustrated above. Each of these steric interacgions is approximately equivalent to one gauche butane interaction of 0.9 kcal/mole, so the total is 1.8 kcal/mol. The point of the gauche butane comparison is that the H/H distance of the sterically hindered hydrogens is almost exactly the same in gauche butane as with axial methyl cyclohexane, except that there are two such H/H interactions in the latter case. 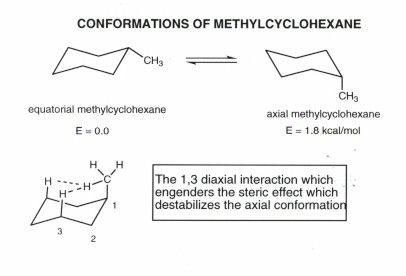 The steric interactions in axial methylcyclohexane are referred to as "1,3-diaxial interactions", because the interactions involve two axial atoms or groups (one H and one CH3 and the carbons bearing these atoms or groups are 1,3 related. THE "EQUATORIALITY PRINCIPLE" PROVIDES THAT ANY SUBSTITUENT PREFERS TO OCCUPY THE LESS STERICALLY HINDERED EQUATORIAL POSITION, IF AT ALL POSSIBLE.IN THE CASE OF DI- OR POLY-SUBSTITUTED CYCLOHEXANES NOT ALL SUBSTITUENTS CAN OCCUPY ALL EQUATORIAL POSITIONS IN EVERY ISOMER, BUT THAT ISOMER WILL BE THE MOST STABLE IN WHICH ALL OF THE SUBSTITUENTS OCCUPY EQUATORIAL POSITIONS(see examples below). Note that with the 1,4-disubstitution pattern, the diequatorial (mosts stable) arrangement is what we call the "trans" isomer. in it, one substituent is "slant up" and one "slant down". Ring flipping gives a conformation in which the methyl substituents are anti (dihedral angle of 180) to each other, but this is still trans, and thisconformation is less stable because it has two axial substituents. There is another isomer of 1,4-dimethylcyclohexane, the cis isomer. 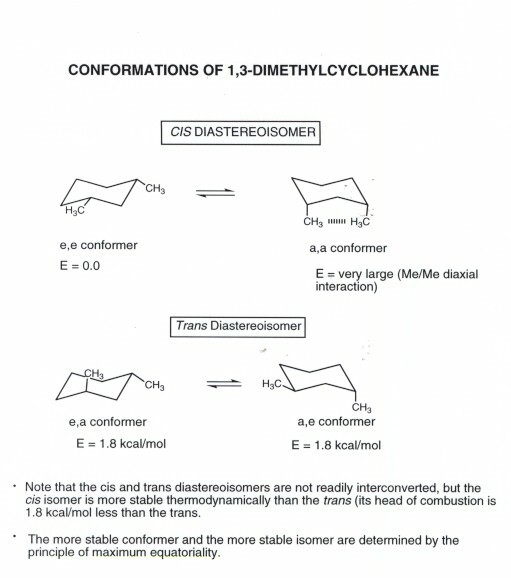 Recall that cis and trans isomers are diastereoisomers, they are not different conformations of the same isomer and cannot be readily interconverted by a simple rotational process (a bond would have to be broken).In the cis isomer, here, one methyl group is equatorial and one axial, and ring flipping simply gives another equivalent conformation. Since one methyl is axial, this costs 1.8 kcal of steric strain. Consequently, the cis isomer is less thermodynamically stable than the trans, which has no steric strain in the more stable conformation. The energy difference is again, 1.8 kcal/mol. In the cis isomer, one substituent is vertically up (or down) and the other slant up (or down). So they both point, in a general sense, in the same direction, i.e., both up or both down. In the 1,3-disubstitution pattern (whether it is dimethyl or any other 1,3-dibsubstitution), both groups can only be equatorial when they are both cis. So the cis isomer is the more stable isomer in this case. Ring flipping gives a conformation of the cis isomer which has both methyls axial. Worse than that, they are both on the same side of the ring, so it is not an axial methyl/axial hydrogen interaction any longer, it is an axial methy/axial methyl interaction, which is sterically much worse. Consequently this ring flip is too energetically difficult, and this conformer can be neglected in he conformational analysis. The trans-1,3-dimethylcyclohexane isomer , on the other hand, has one methyl axial in both ring-flip conformers, so that it is less stable than the cis isomer by 1.8 kcal/mol. Both trans-1,4-dimethylcyclohexane and cis-1,3-dimethylcyclohexane have essentially the same energy, since neither one of them has any strain at all. 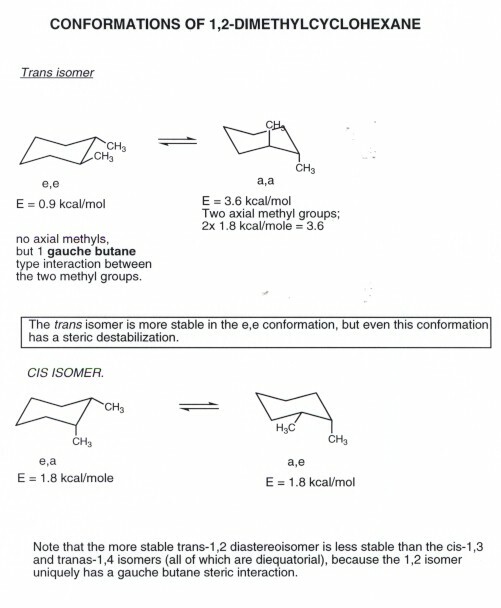 The 1,2-disubstitution pattern is very much like the 1,4 pattern, in that the two groups can only be equatorial if they are trans, so the trans isomer is more stable than the cis. The diaxial trans conformer has 3.6 kcal of steric strain, of course and is much less favored than the diequatorial conformer. The cis isomer is less stable than the trans because in it, one methyl must be axial. 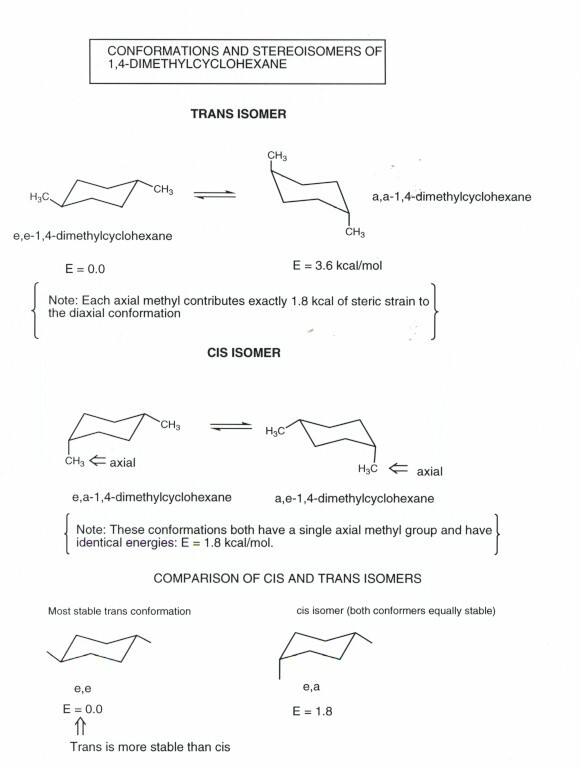 The cis isomer is therefore less stable than the trans by 1.8 kcal. The key difference between the 1,2 and 1,4 patterns, is that in the diequatorial 1,2 conformation, the methyl groups are gauche as in gauche butane (remember that gauche essentially implies a 60 degree dihedral angle ). Consequently, this diequatorial conformation no longer is strain free, as was the 1,4-trans diequatorial conformation, where the methyls are very far apart. The 1,2-diequatorial isomer is 0.9 kcal/mol less stable than the 1,4-diequatorial isomer, because of this gauche butane-like interaction (recall that the gauche isomer in butane is destabilized by exactly this amount).